The honeymoon is over. My parents have gone home. Elliott’s back to work and I’m on my own with two kids all day long (and have been for over a month now). Finding “me time” – much less blogging time – has been a challenge, but you gotta start somewhere! So here’s how the story of my life with two kids began. 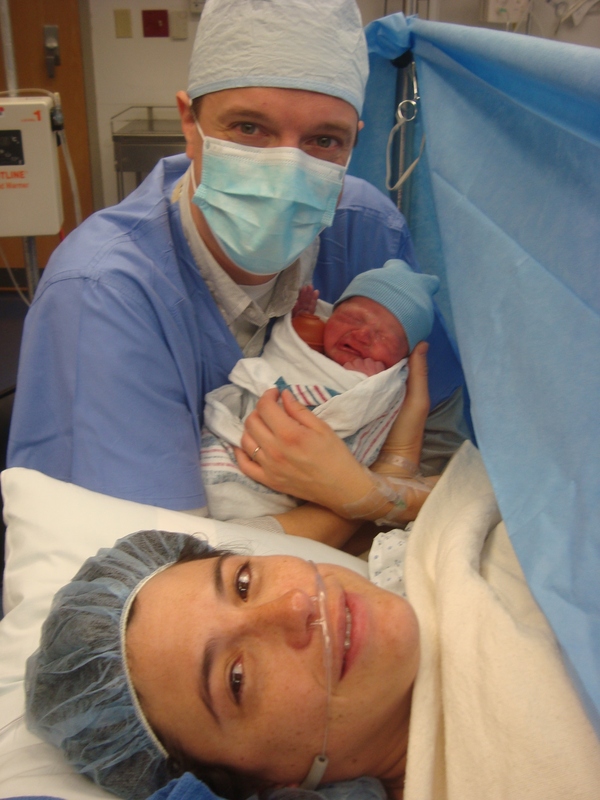 Unlike Lilly’s delivery, which was a mostly impromptu tour of birthing possibilities — induction, laboring without drugs, laboring with drugs, labor with complications, emergency c-section — Henry’s delivery proceeded like a well-oiled machine. Elliott and I strolled into the hospital at 6:30 a.m., registered for an 8:30 a.m. scheduled c-section, chatted with some friendly nurses for a bit as they poked my arms and other regions and hooked up a fetal heart monitor and whatnot. I walked into the O.R., hopped up on the table, let them jab a ridiculously long needle into my spine and away we went. Once I was on the table, getting numb, I was shielded from viewing most of the action, so my very funny anesthesiologist sat on my side of the screen and gave me the play by play until Elliott came in to take over. I thought that was pretty funny, but I wonder how many times a protective, anxiety-ridden soon-to-be dad has punched him in the face for that joke. If the lead up to the delivery flew by in the blink of an eye, the wait to actually see my little boy after he was delivered seemed like an eternity. Elliott got to immediately walk over to where the nurses were cleaning Henry up and taking measurements to meet his son and snap some pictures. I was lying there listening as intensely as I could to every sound from the other side of the O.R. and waiting anxiously as the anesthesiologist wiped away my tears of joy for me. Finally, I got to meet my little boy. And he was, in that moment and forevermore, perfect. Even if he did scream for two straight hours. The Perfection by MushBrain, unless otherwise expressly stated, is licensed under a Creative Commons Attribution-NonCommercial-NoDerivs 3.0 Unported License. Terms and conditions beyond the scope of this license may be available at mushbrain.net.